Future Shopâ€™s Day 5 of its 10 days of deals is a HP Photosmart 5.1MP Digital Camera with Extra Lithium-Ion Battery & Leather Case (R818) for $249.99 (regular price $449.99). If you click on the â€œSpecial Offersâ€ tab on Future Shopâ€™s website it also mentions that you get 50 FREE 4″ x 6″ Future Photo Prints! Although Sony and Canon have a better reputation in digital cameras, HP is doing its best to produce high quality competitive products. Lens is high quality Pentax lens and other specs include 5.1 mega pixels and 5X optical zoom (which is really good). Check out full specs and details here. Check out the HP Photosmart 5.1MP Digital Camera here. A free Sign up to Future Shopâ€™s Future Photo gets you 10 free 4â€ x 6â€ photo prints with your first order! Great deal. 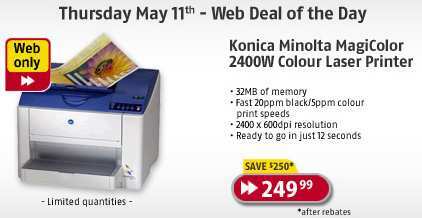 Check out this Future Shop Photo offer here. 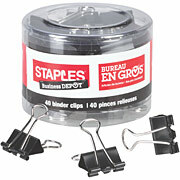 Staples Business Depot Binder Clips, Small 3/4″. 3/8″ Capacity black are on sale for $0.66 (regular price $4.97). You can see this deal online here but since Staples charges for shipping you are much better off buying it from any brick and mortar Staples store in your area. These binder clips will always come in handy and you canâ€™t really go wrong for 66 cents! I just noticed that I almost always post about some really good deal from Shoppers Drug Mart. Theyâ€™re really doing a great job out there and I just love their whole marketing strategy. 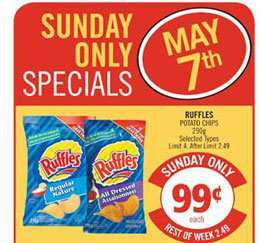 In this weekâ€™s Shoppers Drug Mart flyer, Shoppers is having Sunday (May 7th) Only Specials. Ruffles Potato Chips 290g are on sale for $0.99 (regular $2.49). Check out Shoppers Drug Martâ€™s flyer here for all the deals. Itâ€™s Day 2 of Future Shopâ€™s 10 days of deals. 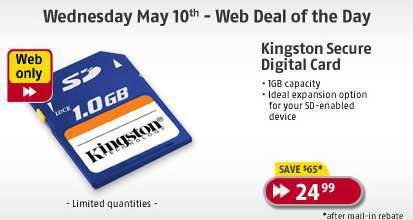 Todayâ€™s deal is a Kingston 256MB Data Traveler USB Drive for $4.99 after a $13.00 discount and a $17.00 mail in rebate. The mail in rebate is a bit of a hassle. But I have good experience with Future Shopâ€™s mail in rebates, so I just went for it and ordered 2 USB drives. Kingston produces high quality products and $4.99 is just unbelievable. Just for your info, 256 MB can store loads of documents and files. It cannot however store large videos like an episode of LOST or a fullÂ movie. You need larger drives for videos. Future Shop is having 10 Days of Web Deals. Todayâ€™s deal is a SanDisk E100 512 MB MP3 Player. It is reduced to $49.99 (regular price: $129.99). 512 MB can save about 125 songs (500 minutes) which isnâ€™t bad for non-musicaholics. This model is being discontinued but I still personally find that for $49.99 it is definitely a hot buy. This mp3 player is also expandable to 2 GB. Although I have an iPod video I bought one of these to use as a nice gift. This Saturday May 6, 2006, $10 Savings Cards will be given away at all the Bay stores across Canada to the first 200? visitors. You have to go real early to get your $10 gift card. I’m not sure if a minimum purchase is necessary but it’s still awesome if you can get your hand on one of these $10 cards. In next weekâ€™s Toys R Us flyer (starts May 6th,Â ends May 19th) buy 1 Playstation 2 or Nintendo Gamecube game and get the second (of equal or less value) for free! Pretty good deal in my opinion.